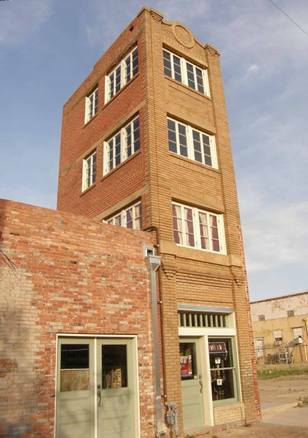 World’s Littlest Skyscraper, Wichita Falls, Texas Landmark. We first learned of this architectural aberration when it was included in the Texas Historic Commission’s Most Endangered Properties in 1991. At that time ownership was in the hands of a non-profit organization and the estimated cost of rehabilitating the building was given as $50,000. 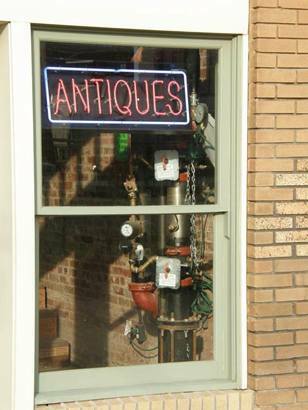 Today rehabilitation is complete and the formerly vacant building now houses a neat-as-a-pin antique store. 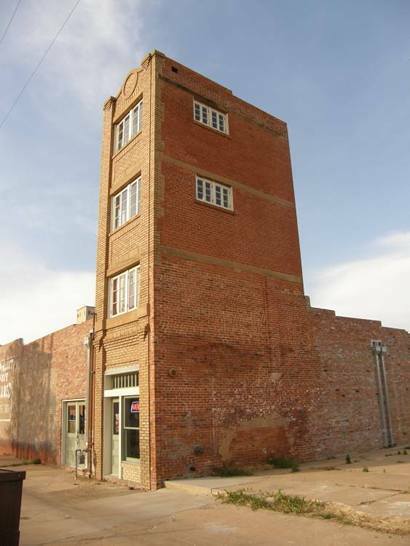 An article in the Wichita Falls newspaper stated that the top floor was recently rented for a Valentine Day’s dinner. The accompanying photos didn’t show room for a violinist – or a waiter – so it’s assumed the dinner was more of a indoor picnic. Like the old joke about the kitchen that was so small only one egg could be boiled at a time, one has to assume that when an antique is sold in the shop here, change has to be made outside. The nameless man who cooked up the idea for this full-sized miniature made off with an estimated $200K. which back in 1920 was some serious money. Everything was on the up-and-up and indeed, the building’s longevity proves that no corners were cut in either material or workmanship. But promotional photos of the building were taken from the sidewalk – giving the impression that the building disappeared into the clouds - not unlike Jack’s fabled beanstalk. The only discrepancy was that on the building’s blueprints, the scale was 1/ 12th of normal. One foot was reduced to one inch. Investors assumed that their property was destined to be a landmark building from which Oklahoma could be seen, or dirigibles could be tethered. In reality it turned out to resemble a fire department training tower. Another view of the "skyscraper"
Facts on this fiasco are scarce since embarrassed investors kept quiet and the seller forgot to leave a forwarding address. In truth, the building has become a landmark, albeit a landmark of caution and folly.